For information about dates and locations of our exciting July 2019 concert schedule, go to the soon-to-be updated Concert Calendar for details. Songs of Hope™ is a six-week, overnight performing arts summer camp in Saint Paul, Minnesota, USA for kids aged 10 and older from around the world. 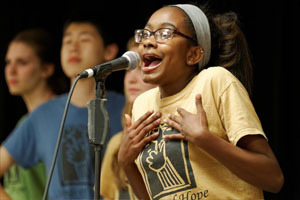 More than just a performing arts camp, Songs of Hope™ offers participants a unique opportunity to live in community with kids from other countries and cultures while learning and performing music from many countries. Each summer, a select group of no more than 60 children and young adults venture to Minnesota from Europe, Asia, Africa, Latin America, the Middle East, and the U.S. They arrive as strangers but soon find themselves embraced in a closely-knit, supportive community as they learn popular songs and dances from each other’s cultures. Then, they take these songs of peace, love, and respect into neighboring communities in a joyous celebration of cultural unity, delighting their audiences along the way. The lessons learned during these six weeks are profound. The friendships are enduring. And the stories are inspirational. Taking part in the Songs of Hope™ camp is a transformational experience. To learn why, please explore this website. We have a lot of details, videos, and photos so you can read, see, and hear for yourselves. Global Reach Arts & Cultural Camp™ is a two-week, overnight summer camp in Saint Paul, Minnesota, USA for kids aged 13 and older from countries around the world. More than just a summer arts camp, Global Reach™ offers participants an amazing experience sampling the rich diversity of U.S. culture through the arts - music, dance, theater, visual arts, and more - with many opportunities for hands-on learning, trying, doing,, and growing. With an extra week of English-language study and a home stay with a U.S. family, Global Reach™ adds up to an exciting and enriching summer experience! A sampling of our campers from many, past years. Click on the blue markers below to learn more. Tel: (651) 225-4179 | Fax: (651) 225-4175 | Email Us© 2008 Sounds of Hope Limited. All rights reserved. A 501(c)(3) tax-exempt corporation.